Do anda really think it would work between Pocahontas and John Rolfe as a couple after the sequel? Do Uou think Pocahontas II is the worst Disney sequel ever! If Disney makes a Live-Action Pocahontas, out of my bahagian, atas favorites, who would anda prefer being "Pocahontas"? Which was the greatest reason that Pocahontas II became so unpopular according to you? pilihan peminat: Replacing of Pocahontas Cinta interest. pilihan peminat: Absolute! It dont deserve to be called the true sequel. Would have Pocahontas and John Smith rekindle there Cinta if John Rolfe haven't stepped in to the picture? Why do anda hate Pocatontas 2? 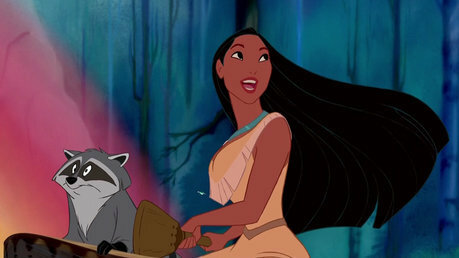 What is Pocahontas's Hair Type? Straight, Wavy, atau Curly? Did anda like the fact that Pocahontas fell in Cinta with another man on the sequel and forgot John Smith??? I loved Pocahontas as a kid. It was the first movie I ever saw in a theater. I had a Pocahontas doll, she was on my kegemaran t-shirt, and I watched my trusty old VHS copy all the time. I live in the area and my family supposedly traces back to her tribe, so there was no doubt who my kegemaran princess was. And then, as I got older... I started doing a little research, and found out how incredibly fictional the movie was. It’s so hard to choose the right path. If I choose wrong, I will feel my Father’s wrath. And will insist that I do as he commands. And I am willing to put up a fight. I fell for a pale face. The feelings I have can’t be erased. And he was finally able to comprehend. We could have one adventure after the other. I never want to be with another. Muzik sejak Alan Menkin & Stephen Schwartz who also did Muzik for The Hunchback of Norte Dame & Enchanted ,Pocahontas is based on real events and it is Disney's 33rd feature length movie about a native indian who falls for an english sailor who arrives in Virgina in order to find emas for Radcliff (the Vilian in the movie).Meanwhile Pocahuntas's father the Chief powhatan wants her to marry Kocumn . Pocahontas does not want this marriage, and asks the Nasihat from a talking pokok spirit named Grandmother Willow. Grandmother Willow tells Pocahontas to listen to her heart. a comment was made to the poll: Do anda think they should make a pocahontas 3? a poll telah ditambah: Do anda really think it would work between Pocahontas and John Rolfe as a couple after the sequel? a comment was made to the poll: if your pocahontas,who anda will choose? Which tahun did Pocahontas come out? Pocahontas- a crude and poor attempt of "disneyfication" of history?